As I was preparing the music for "ARROWS" which was to be my last recording as a leader for Columbia Records, the running 'themes' from the previous recordings must have been evident. When I listen back now, some 25+ years later, it is remarkable to me how very pronounced the influence of Latin music was on me. At that time, I was nearing the 10 year anniversary of my move to New York and perhaps composing a small tribute to this great and vibrant city was a means of reflecting back on all that it had given to me in such a short period of time. 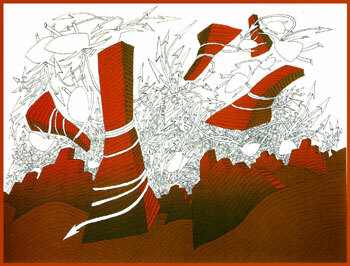 The titles for both of the individual part of the "City Suite" were drawn from paintings I had seen at a recent exhibition by my dear friend Jean-Michel Folon. "City Monsters" was, I know, an image with lots of arrows indicating motion in all directions and, in a sense, conveyed a bit of the overcrowded madness that exists here in New York. But, as most musicians know from our slang of a bygone era, great musicians are also referred to, and with reverence, as "monsters." And so, the music was intended as a tribute to all the musical monsters who had touched my life. 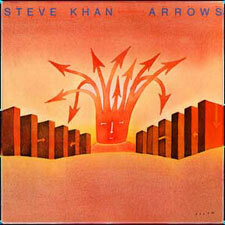 The basic dates for the "ARROWS" sessions were recorded between May 7th-9th, 1979 at Mediasound Studios. The "City Suite" was recorded on May 8th. Though I have addressed this in several analyses related to the music from this period, on each recording, I tried to have at least one piece which would reunite the fantastic sound and phrasing of Randy Brecker: Trumpet, Michael Brecker: Tenor Sax, and David Sanborn: Alto Sax. I also tried to have a piece which featured the mounted cowbell work of drummer, Steve Gadd. Then, when you add in the special contributions of Don Grolnick: Keyboards; Will Lee: Elec. Bass; Jeff Mironov: El. Guitar; and Errol "Crusher" Bennett: Percussion, you can't get much better support than that! As you will hear, these wondrous players executed this rather difficult chart with their own special brand of excellence and craft. When I listen to this particular piece, I just can't believe that I wrote so many notes for the horn section. When I hear what they had to play, I can't help but laugh because it sounds so difficult, bordering on absurd. But, as they always did, they made something special and unique out of it. On these recordings, I also tried to make certain that the soloists were there with us live, so when we cut this tune, Michael Brecker was there with us for the extra inspiration. The horn section was overdubbed later though the parts had been written prior to the initial session. Serving as yet another fitting tribute to Steve Gadd's superb musicianship is the fact that, while we were recording the track, he 'cut' some of those horn figures without them even being there. Just recently, I decided to rewrite all the lead sheets for these two pieces of music. The truth is that I really did not write them correctly the first time. I wrote them both in 4/4 when they should really be written in cut-time and felt 'in two.' This is really the way almost all double-time Latin arrangements are written out. You never really see pages of 16th-notes in a good Latin chart. So, you can only imagine how condensed and compact the originals must have looked, especially those horn parts. I have the originals here at home. This was also the first recording where I knew that my Strat had become an important part of my 'voice' in those years. I believe that what happened, and I could have this reversed, was that I played the original 'take' on the Strat and played a live solo with it too. But, I think that when I heard it back, I felt that I didn't like the sound I was getting, and perhaps I had overdone the dips and dives with my tremolo arm. So, I believe that I overdubbed the solo with my Telecaster Custom. However, after some 25 years, it is also completely possible that I played the Tele live and overdubbed the Strat melodies later. In order to be more capable of discussing the rhythmic elements at play here, I, once again, had to consult with my dear friend Rafael Greco from Caracas, Venezuela, because I wanted to understand, from the perspective of Latin music, just what kind of approach Steve Gadd was using during the [I] sections of this piece. What I learned from our conversations was most interesting. If one is to view the history of Latin music, the full drum kit really did not fully enter become integrated in the music until the mid-'80s. Although, Rafa did play for me a recording by Cuba's Irakere which did something quite similar. However, even though Will Lee's bass part is a rather normal 'tumbao', apparently Steve Gadd is applying a fusion of Brazilian rhythms over that. So, in truth, this was much more of a rhythmic fusion than I had known or had envisioned. If you study the chart, the lead sheets, it's easy to see that a great deal of care went into all the details, but, such was the way of the "Fusion" music of that period. One of my foggy memories of rehearsing and recording this piece was a particular 'look' that Mike Brecker gets on his face when he doesn't like something too much. When two people have become close friends and have worked together a lot, one recognizes these expressions, and I recall asking him, "What's wrong?" He went on to say that he was having trouble distinguishing the D/E[Bm7/E] sonority from the D/G[Gmaj7(9)] sonority. This occurs during [C]. The correct mode for D/E is B Dorian[B, C#, D, E, F#, G#, A] and the mode for D/G is could be G major or G Lydian[G, A, B, C/C#, D, E, F#]. So, other than the difference of G# and G, there really isn't much to differentiate one chordal sound from the other. Of course, when Mike told me this, I was a bit bummed, because I had labored so hard to make this piece harmonically interesting. But, I certainly can see and hear what he was talking about. As a tribute Michael's harmonic inventiveness, I transcribed a Solo Excerpt, and this passage should appear as the soundclip is fading out. In bars 5-6 of the excerpt, you can see how he briefly plays 1/2-step above the center of Bm7/E by flirting with a Cm7 area. He returns 'home' when the B-natural appears. 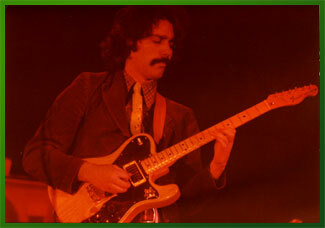 Prior to and after this moment, most of the solo consists of his playing with a great R&B feeling, and using B minor pentatonic[B, D, E, F#, A] as a base for the improvisation. This particular pentatonic sounds great over the Gmaj7(9) chord as well, so this makes it the perfect choice because of all the common tones. And, in the end, the usage of common tones will help to glue together any improvisation. In hindsight, what now bothers me more than anything is that, other than the changing of the chords, there is really no 'bridge' for the piece. It's just one long drawn-out [A] section. From a compositional perspective, I would certainly change this were I ever to want to perform this piece. Of course, as it is part of a 'Suite' one could say that the second part, "Dream City" serves as the contrasting section. As I attempted to do when looking at the horn parts for "An Eye Over Autumn" and "The Little Ones" from "THE BLUE MAN" as well as the title track from "TIGHTROPE" I wanted to share with everyone just how these parts were created. Firstly, the influence of Randy Brecker's writing and arranging style is everywhere. 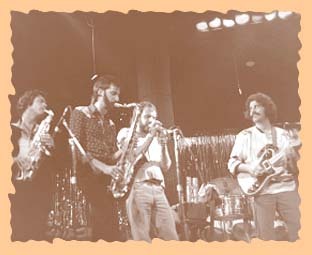 When I was a member of the Brecker Bros. Band during the mid-'70s, I used to listen very carefully to the horn parts, especially when we were rehearsing a new tune for the first time. There would always come a moment when the horns would play 'a cappella' to check the notes and the phrasing. Then, sometime later, I would go over and look at the individual parts or the score, if Randy had one. I wanted to see how he was getting so much out of just three horns. Firstly, all the 3-note voicings I have employed here on this chart can be played on the guitar. And, you should not be surprised by how many simple major and minor triads appear. More than anything, no matter what one chooses or attempts to write when you have three spectacular instrumental voices like the Brecker Bros. and David Sanborn, they are producing a sound that is never easily duplicated just because of their individual styles, and their willingness to go with the best idea for phrasing. That could come from any of the three. As it was in most cases, Randy always played the top voice, Sanborn plays the middle voice, and Michael handles the lower voice. As it is in most 'big bands' I believe that David and Michael lean on Randy for where to place the emphasis. I don't think any group of horn players ever played staccato 16th-notes better than these guys!!! And, of course, I mean no offense at all to the fantastic horn sections of Tower of Power or Earth, Wind, and Fire. For those of you who are, like me, huge fans of this horn section, or of great horn section playing in general, my favorite obscure piece of work by Randy, David, and Michael, with the inclusion of their 'fourth voice', the brilliant trombonist Barry Rogers can be found on the Ralph MacDonald recording titled "THE PATH." The horn break takes place on the title track, which was intended as a musical tribute to Alex Haley's book, "ROOTS" and happens at the 12:11 mark, following a great Oberheim solo by Bob James. Trust me, this is amazing horn playing!!! And, you are in luck as we have provided you with a great soundclip above! On a lighter note, the biggest problem we used to have, when recording or just working together, was to simply get the three of them to play, and to stop laughing. Wow, they were so funny together. Firstly, you have all the in-jokes that come from the love and respect that exists between two talented brothers. And then, on top of that, you throw in Sanborn and friendship and chemistry that exists between the three of them and it becomes almost impossible to get them to play seriously for 2-minutes. When they would finish, I always had a total stomach ache from laughing so hard at them and with them. Those moments will remain amongst my treasured memories. The horns were recorded on May 14th, 1979, and that was the day of the "laugh-fest." Earlier, I mentioned some of the small details that went into this arrangement, while rewriting it, I was reminded of that when I noticed the little whole-tone passage that occurs during letter [B] in the rhythm guitar part, which was so beautifully executed by Jeff Mironov. The chord is C7(9b5) and this kind of sonority can be approached in a whole-tone manner, but usually, especially while soloing players will employ G melodic minor[G, A, Bb, C, D, E, F#] over it. As you can see, from a linear perspective there is no G#. But, in the rhythm part, it's effective because it goes by quickly during the melody and no G-naturals appear. To make the harmonic transition to Part II of the Suite, "Dream City", I moved the main melodic material down a major 3rd to a Bb/C sonority which holds out over the final 2 bars. Even though we headed towards Bb major, the fact that the top voices are, spelling up Bb-D, this affords us just the right connection to the acoustic piano montuno which is about to come from Don Grolnick. The emphasis there, as you will soon see, is on the interval of the 3rd: Bb-D. So, it works! It's interesting that I chose this route because it seems that, had I opted to just go up a 1/2-step to Eb/F, which is the true V7 of Bb major, this certainly would have worked too. The beauty of offering these lead sheets here is that, IF one of you chose to play the tunes, you could easily change various aspects of the arrangement. Let me know how it works out. As I have done on several occasions at the site, I would again want to thank my good friend, the great engineer, Elliot Scheiner who graciously served as my co-producer for "ARROWS." I also have to thank another dear friend, engineer, Doug Epstein who recorded virtually all the overdubs for these sessions. We all remain friends to this day and, in addition to their talents, they are both wonderful people!!! Thanks guys!! !